For those of you keeping track at home, the score is currently 1 to 4 in my battle with Nick to cover the most limited edition Turkey Hill flavors this year. I know, I know, I'm slacking, so let's make it 2 to 4 with a flavor that's been the limited edition August flavor since 2012 but this was the first year that I was actually able to easily pick up a carton of it. Yeah, that's pretty much the grayish brown color we've all come to expect from dark chocolate flavors. And like the others I've tried, it's not a very drying or bitter dark chocolate, but it's definitely not milk chocolate. I'm also not getting that weirdness that I would get after several bites of the Perry's version, so that's a plus right there. Do I like it? Yeah, I do. Can you guess why? 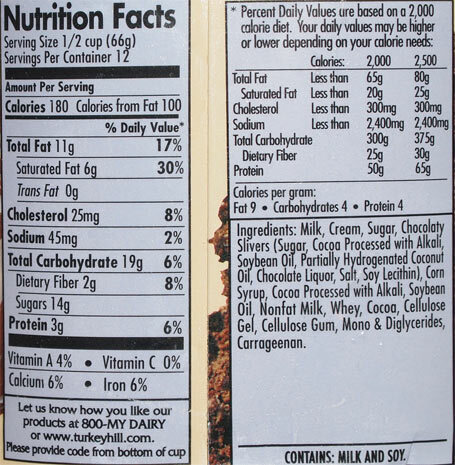 Look closely and you will see all the "chocolaty slivers". They are too small to have the same fun impact of the stracciatella that Talenti uses in several of their flavors, but it spices up the texture enough to keep this one interesting. Dark chocolate always seems to get boring quickly on it's own, but the slivers definitely help keep you going. On Second Scoop: I know Nick assumes this one is boring, but, iunno, it's different enough to work. 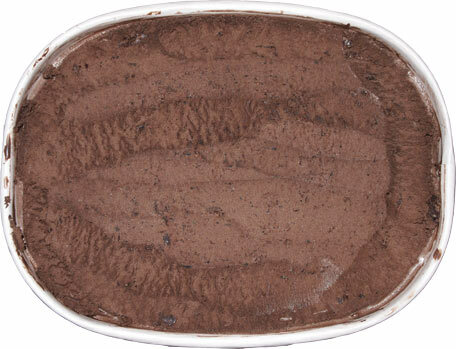 I'm not claiming that I understand the oh so tiny chocolate specks "slivers", this one is definitely not traditional, but it's one of those flavors that if you want to try it, you should go for it. Promise kept! Sure I over-microwaved the ice cream, but I gotta say, they still came out pretty good. 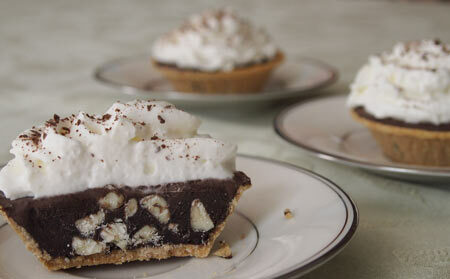 I only wish the whip cream was heavier so as to provide a bit more textural resistance to the dense ice cream pie. That said, I'm pretty sure I'll be experimenting with this again in the very near future. This is one of my fav TH flavors, the kind you only buy 1 of every season but you look forward to the variety once a year. 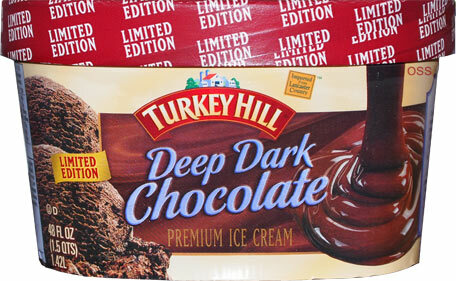 I compared it to Friendly's Deep Choc and it blows it out of the water! Love the ice cream, the slivers are great, but the color is just awful. I opened the carton and immediately had a visceral reaction to the color, which immediately brought to mind the type of sticky diaper mess that was the worst to clean up back when I had babies. this is my absolutely favorite ice cream and was so disappointed to not find it at the store today that I thought for a minute I had lost my mind because I found my self staring at the freezer a few minutes wondering where it went. I am so glad that it will one day be back. color aside the slivers make it just right. I'm getting tires of the same old chunks of brownie and chocolate chips. and about the color, didn't notice. I can't taste color. Eating this right now. Real good stuff. The color is very...unusual. I tried this for the first time this year. Absolutely loved it. I would buy 2 at a time because it wasn't always available. Hands down the best dark chocolate ice cream I have had. Wish I could order it online some how. This is definitely my new favorite ice cream flavor! I happened to see it when I was walking by in the grocery store and decided to buy one to try. Now every time I go to the store, I buy two. It's a nice dark chocolate, and not bitter at all. 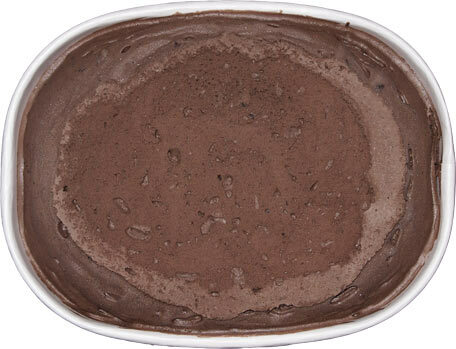 It is very creamy and the slivers of chocolate just melt in your mouth. I'm not sure if they've change the color at all some of these comments are from a few years ago, but the color just looks like I would expect dark chocolate to look.